Chinese President Xi Jinping gave visiting Russian President Vladimir Putin China’s first friendship medal on Friday, calling him his best friend, underscoring the close ties between the two despite deep reservations many Western nations have of Putin. Meeting in Beijing’s Great Hall of the People, Xi lauded their relationship. 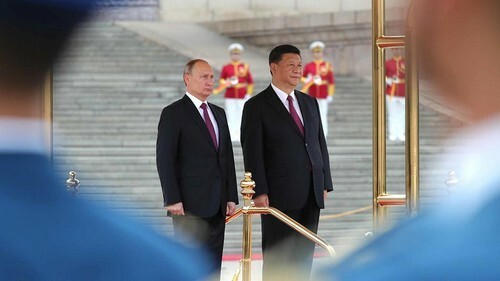 “No matter what fluctuations there are in the international situation, China and Russia have always firmly taken the development of relations as a priority,” Xi told Putin at the start of their formal talks. Xi then awarded Putin China’s first ever friendship medal, on a large gold coloured chain, an event carried live on state television. Xi, speaking just before he put the medal on Putin, called him a “good and old friend of the Chinese people”. “China and Russia are permanent members of the U.N. Security Council and are both great responsible countries,” Xi said. “I see this as an acknowledgement and an evaluation of Russia’s efforts to develop a comprehensive strategic partnership with China,” he said. Washington’s relations with Moscow have been particularly strained in the wake of the 2016 U.S. presidential election, which U.S. intelligence agencies said was targeted by Russia.